Kids love mashed potatoes and they make a nice easy baby food, too. 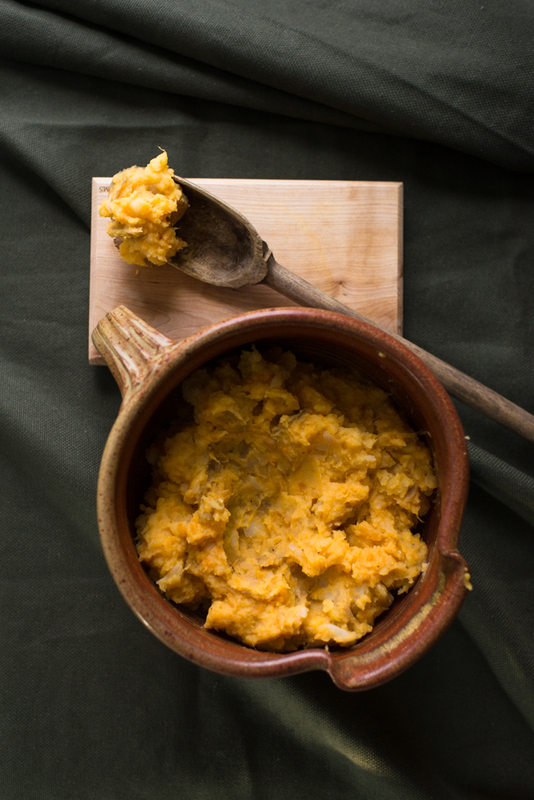 This recipe uses root veggies mashed up with the usual mashed potatoes to create a more rustic, flavorful and nutrition-packed side dish. I slightly modified a Cooking Light recipe to make it more user friendly, and added roasted garlic to bump up the flavor. The result is delicious! I like to keep some of the skins of the potatoes for more texture and added nutrition. To make this dairy-free and vegan use dairy-free alternatives for butter, milk and sour cream. Heat oven to 375 degrees. Place garlic cloves in a small packet of foil with a drizzle of olive oil. Bake for about 25 minutes or until very soft. While garlic is roasting, peel about 60 percent of the skin off the potatoes, and completely peel sweet potatoes and turnips. Cut all of these into large chunks boil in a large pot of water for about 20-25 minutes until softened. Drain and return to pot. Add in remaining ingredients and mash with a potato masher until soft and well incorporated, but still leaving a few lumps for texture. This is a great “Stage 2” food which incorporates some easy, mild ingredients. Leave as little or as few lumps as your baby can tolerate at his or her stage of eating. Be sure to place some on their tray for them to explore with hands and self-feed. Serve to babies prior to seasoning with too much salt.